Perfect to use as a primer or to touch up your makeup, the limited edition GIVENCHY Mat & Blur Touch - Primer and Touch Up Stick keeps your skin looking fresh and shine-free throughout the day. 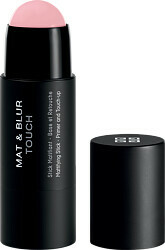 The innovative GIVENCHY Mat & Blur Touch provides your skin and t-zone with an instant matte finish. Through blurring imperfections and equalizing the texture of your skin, its transparent finish smoothes and refines the complexion, hour after hour. The universal pink shade of the GIVENCHY Mat & Blur Touch can be used on any skin tone. Once applied to areas of concern, its soft, velvety finish leaves your skin feeling comforted, nourished and oil-free. Ideal to use on the go, its easy to apply stick format can slot perfectly into your beauty bag. Apply to skin before makeup as a primer, or apply to areas of shine throughout the day to keep your skin looking matte and refined.